About the surgery - Fulham Palace Road, Hammersmith. Wednesday & Thursday until 1800hrs. Map: Click here to view a map of the surgery. The practice at Fulham Palace Road has been run by Michael Burchell for over 60 years and has recently undergone a major refurbishment. It offers modern, well equipped surgery providing a bright, friendly & relaxed atmosphere in which to treat your foot problems All our Podiatrists are registered with the Health & Care Professions Council and are Members of the Society of Chiropodists & Podiatrists having undertaken a three year full time degree. We specialise in the treatment of foot problems and offer advice on how to prevent those problems returning. We take our feet for granted until we get pain in them indicating we have a problem, do not wait for the pain before you seek treatment. We have many years experience in treating all age groups, from babies and young children to adults and the elderly. 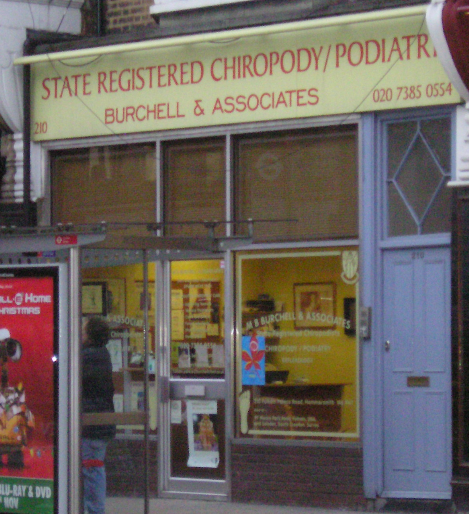 We treat or offer advice about all foot complaints. 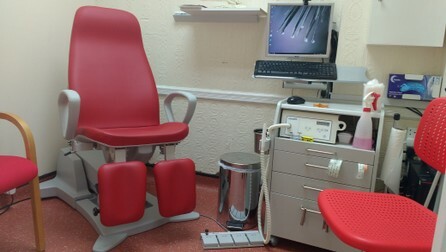 General Chiropody Treatment, (20-30 mins).This is our basic appointment and is suited as a first consultation either for advice and/or treatment. We will examine your feet and advise on the causes of your problem and how you can treat them. If needed we will treat them during this appointment. It is also used for the regular removal of callous or corns caused from ill fitting footwear or foot deformities. Dressing Appointment, (10-15 mins).This is used as a follow up treatment for Verrucae, Nail Surgery or specific problems with Corns/Callous. Biomechanics/Orthotics, (1 hour). Where the cause of pain, walking problems or callous build up has been identified as biomechanical we can analyse your gait cycle using a computerised gait pressure plate to produce a made to measure orthotic/insole to correct the walking pattern.